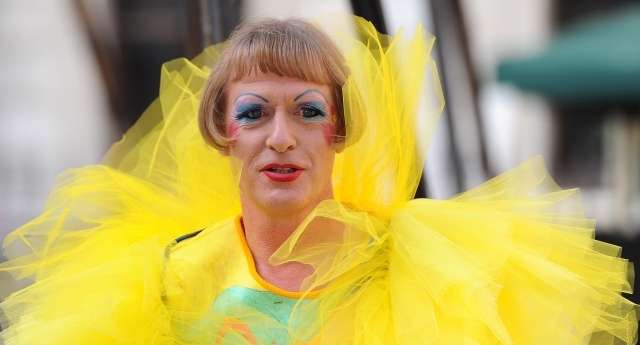 Renowned artist Grayson Perry has made four short films for Channel 4 exploring gender identity. The Turner Prize winner has long been candid about his fluid gender identity, cross-dressing and exploring female alter-ego “Claire”. The artist this week stars in a four-part series ‘Born Risky: Grayson Perry’, which are available online now and will be broadcast on Channel 4 at 11 PM tonight. The remaining three films feature Grayson meeting trans people who have different concepts of gender identity but all take great risks to be themselves. The first is transgender model Tschan, 24, who returns to Brixton where she was bullied when younger. The second is Geoff, 66, a transvestite truck driver who has opened ‘Tina’s Hotel’, a haven for other transvestites at his Essex home. The third person Grayson meets is EJ, 42, a transgender fashion historian who is now comfortable in his male identity – but who bravely wears wear a dress for the first time in 30 years to challenge traditional gender stereotypes. Grayson Perry said: “I am very proud to be part of Born Risky it was fascinating, fun and a privilege to meet and work with three such brave, tender souls. Dan Brooke, Channel 4’s Chief Marketing and Communications Officer, said: “Championing alternative voices is at the heart of Channel 4’s remit and this project perfectly encapsulates the spirit of our Born Risky ethos as well as our commitment to reflecting Britain in all its diversity. John Allison and Chris Bovill of 4creative, said: “Nobody embodies the Channel 4 brand values quite like Grayson. “In a world where hate crime is rising Channel 4’s role to challenge the status quo is even more crucial. Born Risky: Grayson Perry will be available to watch on All 4 and on Channel 4’s Facebook and Twitter platforms today.